Chadwick Boseman, winner of the Best Hero award for Black Panther, presents his trophy to James Shaw Jr. onstage during the 2018 MTV Movie & TV Awards at Barker Hangar on June 16, 2018, in Santa Monica, Calif. The world of Wakanda inundated this year’s MTV Movie & TV Awards, and we’re not mad about it at all. From Tiffany Haddish’s opening sequence, in which she challenges “T’Chadwick Boseman” for the right to rule Wakanda, to Michael B. Jordan’s sharp jab at Roseanne Barr, Black Panther and its cast served us all our favorite moments. This includes Boseman, while accepting the award for Best Hero, paying tribute to James Shaw Jr., the man who disarmed a shooter at a Waffle House in Nashville, Tenn., in April. He then signaled to Shaw in the audience, introducing him and asking him to come onstage. “This is going to live at your house,” Boseman said, handing over the trophy. What a T’Challa thing to do. 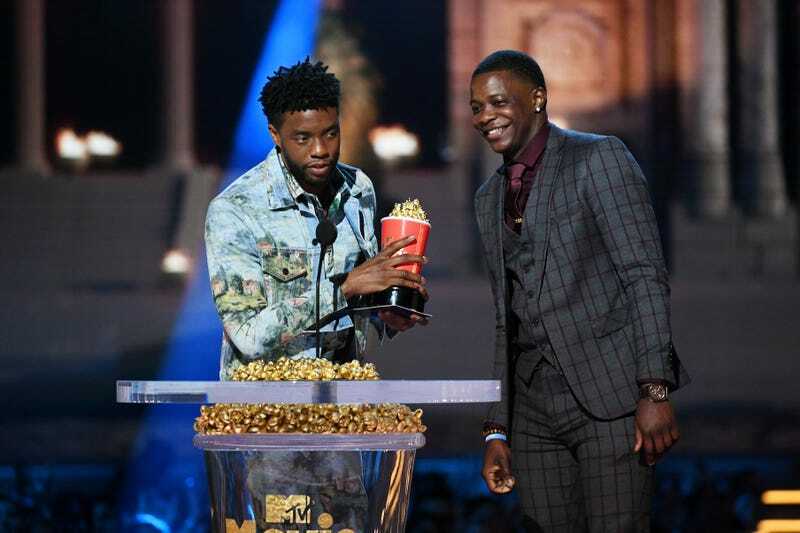 Boseman’s film nemesis, Jordan, received the Best Villain award that night, throwing a well-deserved jab at a certain former ABC sitcom star as he accepted his box of inedible popcorn. Never change, Black Panther cast.